‘This day news reached the town that three men had been murdered in Omata. With wilful imprudence, and in defiance of general remonstrances, they had persisted in looking for some stray sheep. As they were engaged in their fatal search, several rebels in ambush sprang suddenly upon them and put them to a horrible death. Their bodies were afterwards discovered, frightfully tomahawked.’ So wrote Sergeant William Marjouram in his diary exactly 150 years ago today. These were the first days of the Taranaki wars, in which indigenous Maoris fought against the New Zealand government’s land acquisitions and the imposition of a British administration on the Maori way of life. Marjouram was born in 1828 in Suffolk the son of a gardener to the Duke of Hamilton. He had a common school education, but ran away to sea as a young teenager (aged 14 the first time), returning home twice before finally enlisting permanently with the Royal Artillery in 1844. 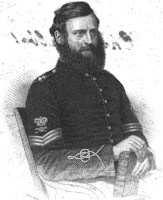 He worked for a while as a recruiter in Newcastle-on-Tyne, and in 1848 was promoted to corporal. However, he was then demoted to the rank of gunner for being drunk and associating with the wrong types; and while on a training course he absented without leave to marry Catherine Pool in 1850. Thereafter, though, his life changed radically. After being posted to Canada in 1851, he turned hard-working and sober, and became an evangelical Christian. He was promoted to an officer’s batman, and in 1854 was made corporal. The same year he was sent to New Zealand, though circumstances led him to return to England once before being sent again to New Zealand in 1855. There he fervently tried to convert the locals in his spare time. He fought in the First Taranaki War, but was invalided back to England in 1861, and died soon after arriving home. Marjouram is remembered today largely because of his diary, first published by James Nisbet in 1863 in Memorials of Sergeant William Marjouram, Royal Artillery including six years service in New Zealand during the late Maori War. The full text is available at Googlebooks. Much more recently, though, in 1990, Random Century New Zealand published a re-edited version of the diary as Sergeant, Sinner, Saint, and Spy - The Taranaki War Diary of Sergeant William Marjouram, R.A. This was edited by Laurie Barber, Garry Clayton, and John Tonkin-Covell. Marjouram’s diary also provides a first hand account of and eyewitness testimony to the First Taranaki War. The New Zealand Wars website has lots of information about the war, but the following background is taken from Wikipedia’s extensive entry. The catalyst for the war was a disputed land sale at Waitara, 16km east of New Plymouth, in the Taranaki district of New Zealand’s North Island. The land was sold to the British despite a veto by the chief of the Maori tribe; and the local governor’s acceptance of the purchase was made in full knowledge that it might lead to an armed conflict. The British, it seems, were convinced that their system represented the best that civilization had to offer and saw it as both their duty and their right to impose it on other peoples. On the other hand, in the 20 years since the signing of the Treaty, the Maori had made significant political advances. For example, they had moved from being a collection of independent tribes to an effective confederation, and one of its uniting principles was opposing the sale of Maori land and the concomitant spread of British sovereignty. On 15 March 1860, the Maori built an L-shaped pa, or defensive strong point, at one corner of the disputed land block, and the following day they uprooted the surveyor’s boundary markers. When ordered, on 17 March, to surrender, they refused and the British troops opened fire, thus starting the First Taranaki War. Here are a few extracts from Marjouram’s diary from the opening days of the war.